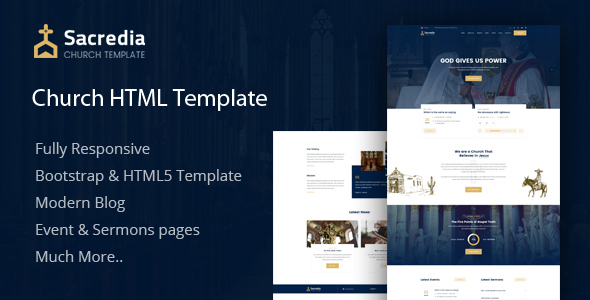 Sacredia is a high-quality HTML Template that was built for churches of any denomination and can be used for most religious-themed websites. It comes with 10 Layered HTML formats that can help you customize how your website will look, and you can adjust its design based on your needs. All necessary pages and elements that are required to customize your website are included with the Sacredia template. The user-friendly features allow admins to easily find the options and settings that they are looking for, with no previous experience required and all located in an easy-to-find menu. Sacredia’s timeless, spacious design and neutral color scheme can accommodate any religious institution and can add that extra flair to your site. Sacredia HTML is a high quality Church Template that will wow your visitors, it has a timeless, spacious design with neutral color scheme that will fit any kind of Church.